The SEALS section is where you can further upgrade the stats of your character. The bonuses are good and it's permanent but the requirements are quite hard to complete. 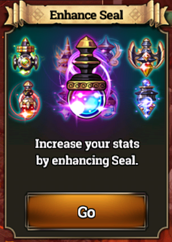 The First Seal (HP+) will open once your character reaches Lvl 25, then the other Seals every after 5 levels. When to Start Upgrading Seals? - Once you have around 1M+ Gold. - At mid game, start by only upgrading Seals to +1 each. Upgrade further if you can, but make sure you have enough Gold for other matters. - Used to pay for the upgrade fees. - Can be farmed from specific Dungeon Stages. You probably have some of these items from the start, this is where you can finally use them. - If you need more, tap on the Element to check where to farm. - Each upgrade will require three gears. - It doesn't need to be exact, the requirement is to place a weapon or an armor that is under the same Hero Class, Gear Type, Tier Level, and Grade Level. - Some Seals will also require other character's gears. Where Can I Farm the Gears? 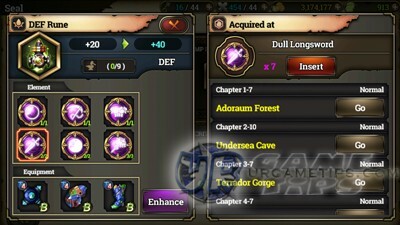 - Dungeon Stages: Check the Tier Lvl of the gear you need, then search for Dungeon Stages that drops that same Tier Lvl of gears, move to the Normal difficulty maps if needed. - Next, upgrade that gear to the required Grade. - If you are lucky, you can also get a Grade B or A gear from unidentified items. - As you progress through the game, you'll be able to complete some missions or events that will give you a Weapon or Shield Coupon, use it to get a Grade B gear or higher. - You can also farm them from Dungeon Stages, by switching to your other character and using the Storage to transfer the farmed gear/s to your main character. This method requires you to level up other characters, so it's optional.